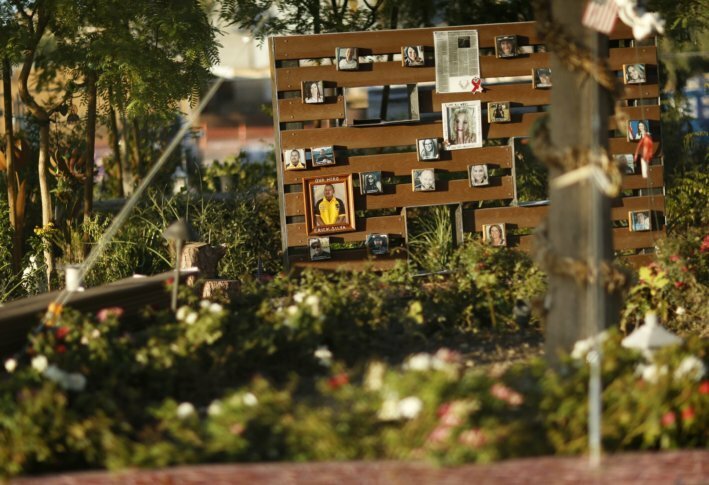 LAS VEGAS (AP) — An image of Angelica Cervantes’ son donning a black-and-yellow security guard T-shirt is one of dozens of smiling photos tacked to walls in a Las Vegas garden decorated with ribbons, cowboy boots, horseshoes and rubber bracelets. Cervantes visits every other week to gaze at the photo that has withstood the desert sun for almost a year, and to ask her son, Erick Silva, to watch over her, his stepfather and his siblings. “Cuidanos,” she begs him, sometimes tearfully. Among the bright lights of the Las Vegas Strip, there’s no indication of the bloodshed that took place there a year ago. The festival grounds are fenced, and green screens block any views to the inside. The flowers, flags, wreaths and other items that crowded a nearby road median and the “Welcome to Fabulous Las Vegas” sign have long been removed. The quarter-acre space was slated to be a dog park, but in the days after the shooting, the dirt lot was leveled, concrete bricks placed, and trees, shrubs, purple pansies, red and white roses and bright pink petunias were planted. A “Remembrance Wall” was hammered together from wooden pallets. “After a tragedy of this magnitude that reveals something so disturbing about human character, people want to do something to reaffirm their humanity, to reaffirm goodness in the world and to feel like they have some agency in the face of something incomprehensible,” said Maynor, a digital scholarship librarian at New York University.